That’s a reference to the uncertainty surrounding President Trump’s vagueness about whether he will approve subsidies for deductibles and co-pays for the poorest Obamacare enrollees and whether his administration will continue enforcing the ACA’s individual mandate in 2018. 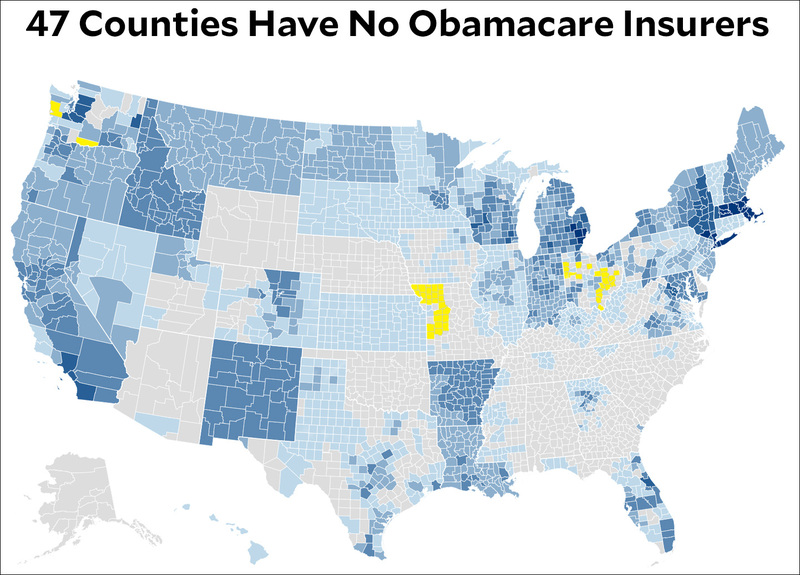 ….The Obama administration worked hard to recruit health insurers to sell to these empty areas. The Trump administration, however, seems to want to stand aside and let Obamacare run on autopilot so it can explode or survive on its own….His administration has waffled on whether it will continue funding key Obamacare payments. He has said he expects the marketplaces to “explode” on their own. A powerful House Republican said Thursday that Congress should immediately provide money for subsidy payments to health insurance companies, which have been demanding big rate increases or fleeing from Affordable Care Act markets because of President Trump’s threat to cut off the funds. The Republican, Kevin Brady of Texas, who is the chairman of the House Ways and Means Committee, went out of his way to make clear that he now believes that Congress should continue the subsidies, which compensate insurers for reducing deductibles and other out-of-pocket costs for seven million low-income people. Most likely, Brady is afraid that the public will blame Republicans if Obamacare collapses on their watch. But I’ll take what I can get. Regardless of whether it’s just an act of partisan self-preservation, CSR subsidies need to be put on a firm footing. Killing off CSR seemed like great fun and games when Republicans weren’t in power, but now it’s suddenly become clear to them that this is serious business that will cause enormous pain to millions of registered voters. It’s sad that this is what it takes to get that through their heads, but it is what it is. Whatever the reason, at least some of them are starting to see sense.